Martin Luther King Jnr, succinctly captured everything that it means to be human when he said “We are not the makers of history. We are made by history”. Our attitudes and ideas are formed, shaped and created by our history, by our ability to learn from it, and hopefully not fulfil George Santayana’s belief that we are doomed to repeat the same mistakes ad infinitum. But even though the world seems to be furiously back-peddling in an attempt to flee to a much “simpler”, far less enlightened and much more terrifying time by allowing the political classes and the shameless charlatans who manipulate them to play on the inherent and baseless fears of simpletons and the uneducated masses through systematic finger pointing and endless rounds of the blame game, I refuse to believe that humanity will go gentle into the fearful night of ignorant darkness. 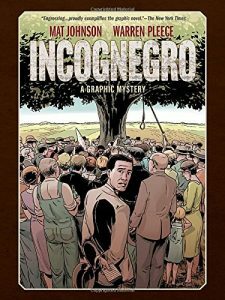 Incognegro completely passed me by when it was initially published a decade or so ago, but there’s never been a more pertinent time for it to find a place on the shelves of book and comic stores and reading lists the world over than right now. While some are content to revel in the comfort of the past, Mat Johnson’s direct, no holds barred tale of what the first half of the twentieth century was really like is all the more frightening as it’s all too easy to draw parallels between the story and what’s happening in every corner of so-called civilised countries in the first half of the twenty first century. 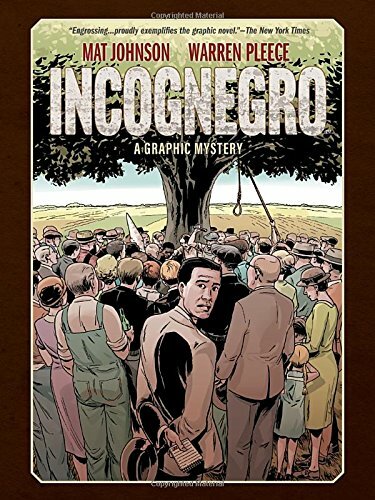 Based loosely around the exploits of African American journalists who, because they could pass for Caucasian, were able to report the truth about widespread illegal lynching’s in the Deep South and the pervasive influence that hate groups like the Ku Klux Klan had on small town America, Incognegro is a powerful, and at times incredibly uncomfortable, story of the seemingly incontrovertible belief that not all men were created equal and that the liberty and justice that is so fundamental to the American way of life did not apply to everyone during the period in which Incognegro is set. On the surface, it’s the story of one such journalist from New York who despite being burned out and sure that he’s taken his luck for granted one too many times, agrees to go undercover for one last assignment when his brother is accused of murdering a white woman in a small Southern community. Knowing the harsh, and brutal, reality facing his brother, he’s determined to discover the truth about what really happened and stop the untimely murder of an innocent man.